Center for Neurodegeneration and Experimental Therapeutics, Department of Neurology, University of Alabama School of Medicine, Birmingham, AL, U.S.A.
Lentiviral vectors are ideally suited vehicles for a broad range of research applications. Depending on pseudotype, lentiviruses infect a wide range of cell types, non-discriminately transducing both dividing and non-dividing cells. As opposed to other popular vector delivery systems, lentivirus stably and rapidly integrates genetic payload into the host genome allowing for long-term studies in vivo. Current lentiviral vector systems can accommodate upwards of ten kilobases of foreign DNA , although promoter and enhancer elements reduce the practical size of gene open-reading frames to perhaps five or six kilo­bases, which is sufficient to accommodate most genes commonly studied in the mammalian genome. Genetic integrants also adopt native chromatin conformation ideal for use in gene regulation studies  and particular lentiviral pseudotypes have been exploited for selective infectivity whereby cells of interest are preferentially transduced; for example, VSV-G pseudotype displays broad tropism but preferentially targets neurons in the nervous system. Besides the ability to transduce virtually all immortal cell lines with high efficiency, lentivirus has been used successfully in the development of transgenic animals and in vivo models of disease (reviewed in ), and interest in gene therapy applications continues to increase. Research laboratories can produce current-generation lentiviral vectors in approved biosafety level-two containment areas with no need for specialized equipment. For optimal safety consideration, the third generation of lentivirus affords the highest level of protection, whereby minimal genetic elements are split among four plasmids that must be expressing simultaneously in individual cells for successful viral production [4-6]. After transfection and subsequent expression of the proteins encoded by the transiently transfected plasmids, the cell medium supernatant contains active lentiviral particles immediately usable to transduce other cells of interest. However, investigators routinely report problems in obtaining sufficient amounts of lentivirus for particular projects, and lenti­virus use in vivo has had varied reports of success in the ­literature. Problems with low titer and toxicity in purified preparations plague common usage of lentiviral vectors. Traditional methods for production of lentiviral titers utilize calcium phosphate precipitation to transfect the four required plasmids into a packaging cell line, most commonly HEK-293T cells . In our experience, this standard approach leads to high variability in transfection efficiencies and corresponding titers, and the concentrated virus can be highly toxic to cells in downstream experiments. Here, we describe a number of advances in the production of lentiviral vectors. There are several new products now commercially available that have clear benefit over predecessor equivalents. Using these protocols and associated products, we have virtually eliminated toxicity associated with lentiviral preparations and routinely obtain titers in the mid to high 1010 transduction units (TU) per milliliter, and, more importantly, obtain consistency in production. The third-generation lentivirus system employs a number of enhanced safety features over the second-generation packaging approach. Three packaging plasmids allow expression in trans of proteins required to produce functional virus. The packaging plasmids pLP1, pLP2 and pLP/VSVG (Invitrogen) were modified to avoid stretches of homology within the plasmids to prevent recombination and additionally contain optimized promoter and enhancer elements for expression in HEK-293FT cells. These packaging plasmids are compatible with a host of lentiviral expression plasmids. For the experiments described here, a lentiviral vector encoding eGFP (cFUGW), WPRE, and cPPT was used. Preference should be given to lentiviral expression plasmids containing the cPPT and WPRE elements that considerably increase transduction efficiency, especially in primary cells. A major limitation and source of variability in virus production stems from variations inherent in commercially available serum products, where lot-to-lot variations of 10,000-fold have been described for some growth factors. We sought to eliminate the use of serum products during virus production and identified a commercially available cell line (HEK 293-FT cells, Invitrogen) amenable to serum-free media formulations. 293-FT cells are clonal derivatives of the fast-growing 293-F cell line variant and stably express the SV40 large T antigen driven from the pCMVSPORT6TAg.neo construct. Over-expression of the large T antigen allows enhanced episomal replication of packaging and lentiviral expression plasmids containing the SV-40 origin of replication and generally enhances lentiviral production through additional unknown mechanisms. 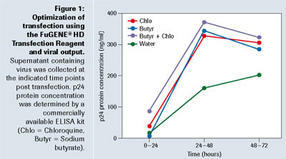 293-FT cells were switched from the manufacturer´s ­recommended medium to a low/no serum-compatible medium (Opti-MEM, Invitrogen) supplemented with 5% fetal-bovine serum (FBS) and 500 µg/ml G418 for growth and maintenance. Culture vessels are maintained at 37°C at 5% CO2 in 95% RH. HEK-293FT cells maintained in Opti-MEM (with Glutamax) supplemented with 5% FBS were plated to approximate 50% confluence in Nalge Nunc Nunclon T-175 flasks coated with polylysine (flasks were treated with 0.1 mg/ml polylysine for 1 hour and washed three times with distilled water immediately prior to use). Sixteen hours later, the medium was replaced with 20 ml of serum-free Opti-MEM supplemented with 25 µM chloroquine. 10.5 µg LP1, 7 µg LP2, 10.5 µg pVSV-G, and 9 µg of lentiviral vector were added to 2 ml of serum-free Opti-MEM. 100 µl of FuGENE® HD Transfection Reagent was added and the mixture was briefly vortexed and incubated at room temperature for 15 minutes. This mixture was added directly to the HEK-293FT cell layer while the flask was gently agitated to distribute the transfection complexes. Eight hours later, 10 µM sodium butyrate was added directly to the flask medium; 24 hours after the addition of the transfection complex, the medium was discarded and replaced with 20 ml of serum-free Opti-MEM with no supplementation. Another 24 hours later, the medium was collected into a 50-ml tube and another 20 ml of Opti-MEM was added to the T-175 flasks. Medium supernatant was centrifuged at 3,000 x g for 10 minutes and decanted into another 50 ml tube and held at 4˚C. After 24 hours, a second collection was added to the first collection and centrifuged again at 3,000 x g for 10 minutes. The supernatant was filtered through a 44-µm membrane. Virus is aliquoted and stored at -20˚C. Thus, each T-175 flask yields 40 ml of viral supernatant that should yield 1-5 x 107 infective particles per milliliter. The protocol can be adjusted to accommodate larger preparations by appropriate scaling. For lentiviral applications outside of cell line use, concentration is usually necessary to achieve high transduction rates. In addition, concentration is required for titer estimation using p24 protein measurements. To concentrate the viral supernatant, 100 µl of Opti-prep density gradient medium (Sigma) is added to Beckman Ultraclear centrifuge tubes, and ~38 ml of supernatant is added per tube. The density gradient medium prevents harsh pelleting and resuspension steps that otherwise diminish titer. The supernatant is centrifuged with a swinging bucket rotor for 3 hours at 50,000 x g and the top 37 ml are manually removed with a pipette. The bottom 1 ml contains a 40 x viral preparation useful for in vitro applications with a usual titer of up to ~5 x 108 TU per ml. For in vivo applications, 1-ml 40 x aliquots are combined into sterile microcentrifuge tubes and centrifuged for 18 hours at 20,000 x g at 4˚C. The supernatant is carefully removed and the pellet is resuspended by gentle manual­ pipetting to the limits of solubility using pre-warmed serum-free Opti-MEM. Viral pellets can also be dissolved in pre-warmed PBS, although the Opti-MEM contains small amounts of protein that act as surfactants to enhance virus solubility. Virus is aliquoted into 5-µl fractions and stored at -80˚C, with an expected titer of ~5 x 1010 TU per ml. HEK-293FT cells or other cells of interest are plated with low confluency onto polylysine-coated 96-well plates with 100 µl serum-free Opti-MEM per well. The next day, lentivirus preparation is added to the first well (recommended 50 µl for 1 x supernatant, 10 µl for 40 x concentrate, and 2 µl for high concentration virus) and volume is brought to 200 µl with additional Opti-MEM. After mixing, 100 µl are removed from the first well and added to the next well, mixed, and 100 µl are removed from that well, added to the next and so forth, thereby accomplishing a 1:2 dilution series of virus. If the lentivirus encodes a fluorescent protein, a well containing an easily countable number of fluorescent cells is identified: each infected cell represents a transducing unit. If the lentivirus does not encode a fluorescent protein, cells are fixed and immunofluorochemistry is used to identify transduced cells. The first steps in optimizing production of lentivirus involved rectifying steps of possible variation and elimination of components that cause downstream toxicity. We identified a cell line (HEK-293FT cells) that was amenable to low or no serum formulations that produce the highest levels of lentivirus. Besides Opti-MEM, which contains animal-derived components, we used two other medium formulations that are chemically defined, namely CD-293 medium and Freestyle-293 media (Invitrogen). We experienced a 20% reduction of lentivirus production when substituting to CD-293 medium, and an 80% reduction of lentivirus production with Freestyle-293 medium (data not shown). Traditional calcium phosphate transfection produces toxi­city in cells, creating cell-lifting problems, and necessitating additional medium changes. Cell lifting and death during viral production releases cell components that become co-concentrated with viral particles, thereby introducing toxic components to viral preparations. We found that FuGENE® HD Transfection Reagent co-transfects the four plasmids required to produce virus with 100% efficiency into low-serum modified HEK-293FT cells. FuGENE® HD Transfection Reagent, as opposed to calcium phosphate, does not cause cell lifting and death, and also does not require an intermittent medium change. We sought to further maximize viral production and transfection efficiency of cells transfected using FuGENE® HD Transfection Reagent through pre-treatment of cell lines with chloroquine and further treatment with sodium butyrate­ (Figure 1). Chloroquine is thought to reduce the degradation of plasmid-containing transfection complexes through partial neutralization of the pH within lysosomal compartments . We found that chloroquine gives both immediate and long-term benefit to viral production, most likely by increasing the effective concentration of active plasmid DNA in cells. Sodium butyrate, which exerts a broad-spectrum effect on transcriptional activity, likewise increases viral production presumably through a combination of up-regulation of viral promoters and boosting protein production output capability . The combination of chloroquine and sodium butyrate treatment modestly increases viral output compared with either treatment alone, perhaps due to a maximal viral output limitation of transfected cells. In vivo usage of lentivirus demands particularly pure and concentrated preparations. To determine whether the protocol described herein produced virus of the required caliber, we injected a 2-µl volume of 4 x 1010 TU virus en­coding eGFP into the anterior region of the mouse caudate ­putamen (Figure 2). After 1 week, we analyzed brain sections through immunohistochemistry (Figure 2, panel a) and immunofluorescence (Figure 2, panel b). 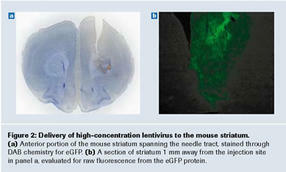 Broad infectivity with minimal toxicity around the needle site and through the striatum demonstrates the high quality of ­lentiviral preparations produced using FuGENE® HD Transfection Reagent. FuGENE is a registered trademark of Fugent, L.C.C., USA. Other brands or product names are trademarks of their respective holders.